Open since 1854, McSorley's Old Ale House (on 15 E 7th St) is the oldest bar in New York and an important destination among pub crawlers. 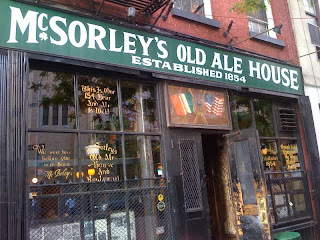 American icons like Abe Lincoln, Teddy Roosevelt, and John Lennon have tried McSorley's Ales. Some of the Old Ale House's mottos include, "Be Good or Be Gone" and "We were here before you were born." Prior to 1970, their motto was "Good Ale, Raw Onions and No Ladies." Women were only allowed into this bar (that began as an Irish working man's saloon) in 1970 after a court order stemming from a lawsuit the year prior. Before you go to this bar, the main thing you have to understand is that McSorley's serves only two beers - a light ale and a dark ale. That's it, just one type of light beer, one type of dark beer, no other brand beers, no mixed drinks, no wines. You also have to get two beers at a time per person (each glass is a half pint). If they ask you, "what'll you have?" and you say "a light beer," they'll bring you two. Don't question it, just drink it and enjoy. It's a bargain at $4.50 for two good quality beers. The beer is delicious, easy to drink, with a gentle aftertaste. If you're a Guinness drinker like us, don't be scared by the light beer - it's closer to a Boddington type of light rather than a watered down Bud light kind of light. 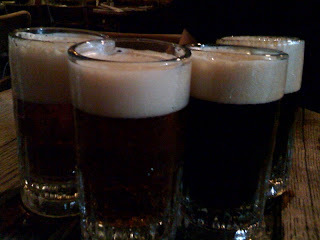 And the dark was just a tad heavier and sweeter than the light ale. There are no menus here. Just like the two beer selection, there is only a two food selection - either a hamburger (with or without cheese) served with fries or their famous white cheese platter with saltine crackers, still in its store bought wrapper, with or without raw onions. Apparently they used to serve this type of cheese platter with raw onions from its birth, when beers cost just pennies. The burger was average - the meat was pretty good but the bun was a bit stale and kept falling apart. But it served its purpose as a good companion to the beer. For eight beers and two burgers with cheese, your tab will be $32. How's that for a bar smack dab in the middle of expensive Manhattan bars? 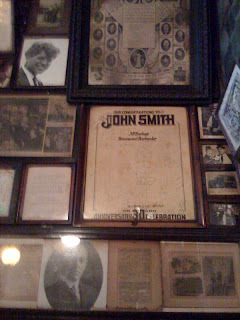 Historical paraphernalia (like Houdini's handcuffs), old photos (including several of John F. and Bobby Kennedy), and newspaper articles on the walls, sawdust on the floors, and the Irish waiters wearing old world gray overcoat jackets give McSorley's that nostalgic "once upon a time" watering hole feel. This old chandelier above the bar has turkey wishbones supposedly dating back to World War I. The legend is that a turkey dinner was thrown for departing soldiers and the wishbones were hung up there by the men going off to war and when they returned, they would remove them. So the wishbones that are left are from the men that never returned from the war. 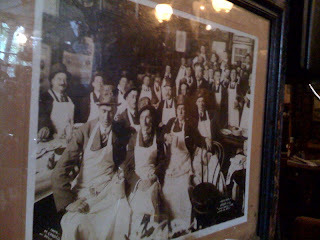 McSorley's Old Ale House is a quaint slice of "old New York" with no frills: no overpriced fruity-tinis, no mango salsa ahi tar tar, no sports game on a flat screen t.v., no music, just two beers, two food choices, good loud conservation, and furniture reeking of 100-year-old brew. But hey, they can run it any way they want; after all, they are the oldest swill beer joint in the city and we love them for it!!! The atmosphere and friendly staff have more character than any $17 per Cosmo lounge in Manhattan - believe it. The crowd was loud and boisterous, and a mix of "Wall Street suits," European tourists, and blue-collar workers. Get there by 5:30 pm though if you want a chance at sitting down.